Did you know that 75 percent of mental health conditions appear before the age of 24? Also, one in every four young adults between the ages of 18 and 24 have a diagnosable mental illness, such as depression and anxiety, according to the National Alliance on Mental Illness. To help people identify and treat mental illness, Northern Arizona University’s Health Promotions will offer a free mental health screening for students seeking help with mental illnesses from 4-6 p.m. Oct. 18 at the Health Promotions Office in the Health and Learning Center. No appointment is necessary for the mental health screening. Instead, students can walk in and be given an assessment with questions about mental health history, lifestyle history and thoughts and feelings on daily behaviors. After the assessment, students will meet one-on-one with NAU health professionals to discuss the next step in improving their mental health. It is important to improve mental health while in the early stages, since the National Institute of Mental Health reports that 30 percent of college students have felt too depressed to function within the last year. A few signs someone might need to identify a mental illness is when they experience changes in appetite, inability to sleep or oversleep, loss of energy, restlessness and deep feelings of sadness. For more information on symptoms and how to help a friend, visit the Health Promotions website. Northern Arizona University and the Arizona Court of Appeals invite the community to attend an oral argument about the case Son Silver West Gallery v. City of Sedona. Son Silver West Gallery and the city of Sedona have had an ongoing legal battle for years. The Son Silver West Gallery violated its permit with the city of Sedona—the gallery was using more space than what was allowed. After this debate, another one started: the Son Silver West Gallery wanted to build a parking lot, which the Sedona City Council repeatedly denied. The oral argument will be held at 10 a.m. Oct. 11 in Ashurst Hall. For classes interested in attending, contact (928) 523-3672 to reserve spots. For students in the Honors College, this event counts as an exploration event. The only local news station in northern Arizona, NAZ Today, turns 10 years old this fall. The Northern Arizona University program is student-run and gives workers the experience they need for jobs in television news, by working with experienced professionals in a real-world environment. Students, who earn credit by working 4-12 hours a week, can work in a variety of positions, including reporters, anchors, producers, directors, technical directors and multimedia journalists. “Our program is unique in that it allows students to start during their freshman year working in a real newsroom, under real deadlines covering important stories in northern Arizona,” said Brian Rackham, director of the School of Communications Media Innovation Center. Former students have gone to work for NBC’s “Today Show,” local TV sports, directing news in Phoenix and Denver, producing news in Phoenix and other TV newsrooms throughout the country. Alumnae Tresa Tudrick and Yesenia Garcia both graduated in 2017 and now have jobs at news stations in Phoenix. Tudrick works as a sports reporter for Channel 12, and Garcia works for FOX 10. Both said NAZ Today was an impactful experience. Throughout the years, students have won several awards while in the program in categories that include TV Sports Story and TV Hard News Reporting. Most recently, NAZ Today won first place for Student Newscasts by the Broadcast Education Association. “Our students have shown that their work is competitive with some of the largest and best-known universities in the country, and we are grateful for this award,” Rackham said. NAZ Today is on five times a week on UTV 62 and Flagstaff Cable 4. Viewers can also stream live from the NAZ Today website. During the summer, STEM students Carmen Robles Baron and Keyla Falcon were selected for a fully funded eight-week international biomedical nanotechnology training program in Hermosillo, Mexico. They trained at the Núcleo de Investigación Científica y Desarrollo Tecnológico laborites, where they conducted their own research using high-tech materials and cross-cultural research. This opportunity was made possible by the Global Research and Internship Program. NAU alumnus Lionel Whitehair published a new landscape-scale study of forest fire history from the Lukachukai area of the Chuska Mountains on the Navajo Nation. Whitehair and colleagues sampled more than 200 fire-scarred trees surrounding Buffalo Pass to retrieve this information. His research will be valued by Navajo Nation resource managers. Peijie Qiu, Xilun Liu, Siwei Wen and Yuchang Zhang received the Best Student Paper Award after presenting their capstone paper at the Institute of Electrical and Electronics Engineers, in Shanghai, China. Their paper, “Development of instrumented bikes for assessment of road and bike trail conditions” is an example of cross-disciplinary student-centered research. A new art exhibit at the Northern Arizona University Art Museum responds to life’s challenges with large, fluid-like graphite and water media works. Artist Lydia Gravis uses a repetitive mark-making technique in abstract drawings to visually communicate. 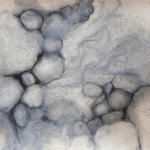 “Lydia Gravis: Mark-making in Liminal Spaces” is on display through Nov. 16. An artist presentation will be at 4 p.m. Nov. 16. Gravis lives and works in Ogden, Utah. She is the gallery director of the Mary Elizabeth Dee Shaw Gallery within the Department of Visual Art and Design at Weber State University. “Instead of taking something specific and abstracting its essence, my work attempts to take something abstract, like the idea of liminal psychological space, and suggest its specificity through visual language,” Gravis said. Her current works use personal experiences as source material for a new direction. Using numerous shades of blacks, browns and blues with graphite, her pieces have a flow-like quality. Creating these works helped Gravis navigate a friend’s terminal cancer with the power of being able to communicate with art. The NAU Art Museum is open from noon to 5 p.m. Tuesday through Saturday at 620 S. Knoles Drive on NAU’s Flagstaff campus. Entrance to the museum is free, although a $2 donation is suggested. Interim Provost Brian Levin-Stankevich announced this week that John Masserini will be the next vice provost for academic affairs at Northern Arizona University. Masserini, who is the associate dean for the Graduate College, will assist in expertise, practices and internal and external relationships to ensure quality and integrity and advance NAU in its mission of student success. Masserini has many years of experience contributing to student success at NAU. Prior to working at the Graduate College, he was associate director for the School of Music, and he remains a professor of clarinet in the school. He received his bachelor’s in music performance from the University of New Mexico and his master’s and doctoral degrees in music performance from Michigan State University. Levin-Stankevich said he was pleased Masserini would become part of the provost’s office and thanked the other internal candidates. Masserini will begin his role as vice provost on Oct. 1.